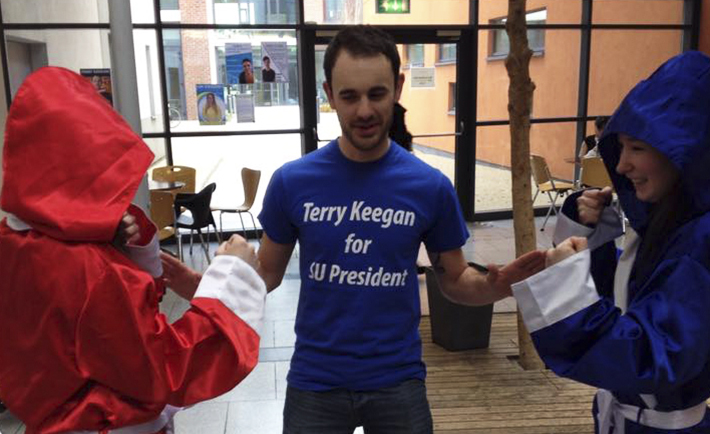 Presidential candidate Terry Keegan has pulled out of the race in the upcoming Students’ Union elections. The final year business student will now not appear on the ballot paper, after deciding to drop out of the election earlier today. Keegan made the announcement on his Facebook page shortly after 1pm. The mature student said his college workload and his lack of knowledge about the role were major factors in his decision to drop out of the race. “I’ve been flat out with final year assignments and as well as that then, the more I learnt about the role, the less I really wanted to do it,” he told The College View. “I went in to it a bit naïve, not knowing 100 percent what the role would entail and what this week and next week would be like in terms of taking up time and just getting college work done. My heart just isn’t really in it so I just decided to pull back out,” Keegan added. He admitted than he found the media and public relations aspects of the campaign difficult, and his decision came shortly after an interview with The College View and last night’s DCU TV debate. The business student declined to say who he will now vote for in the presidential election but said that he liked fellow candidate Kim Sweeney’s idea of bringing in a multi-use swipe card across campus. “I like the idea that Kim Sweeney has about bringing in the swipe card for the whole campus and it was an idea that I was playing with as well. I think that’s pretty good idea if it’s achievable,” he said. Although Keegan is set to finish college this year, he hopes to remain involved in DCU Boxing Club, which he founded 3 years ago.